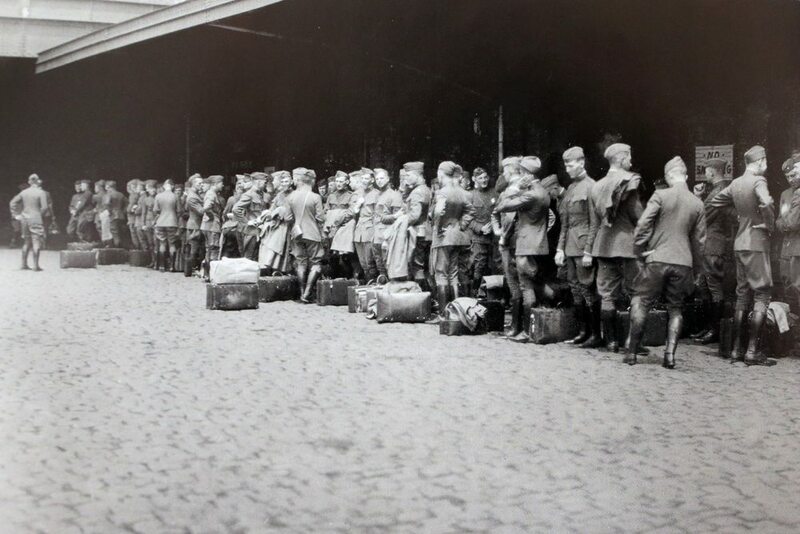 West Point cadets departing for a two month-long trip to study European Great War battlefields in the summer of 1919. Note: We’re revisiting some of our most popular material from the past 10 months for our newer readers; this was originally posted June 4, 2014. Enjoy! There are clearly times when officers must respond reflexively and times where they ought to pause and consider the strategic effect of their tactical actions. This is akin to the two systems of thinking Daniel Kahneman describes in his book Thinking, Fast and Slow. Officers should always be thinking – the type of thinking will differ according to the military situation they find themselves in. The argument I advance is a simple one: West Point does not currently offer any regular study of modern war that is relevant to the needs of soon-to-be junior Army officers. It should. In fact, as I’ll describe at the end of this essay, and as the picture above depicts, this is an old idea that ought to return to cadet education. To develop this idea, what will follow is a list of my responses to the comments (which can be viewed here) from the original essay. James highlighted some challenges with measuring effectiveness in counterinsurgency warfare, particularly the “development and reliable measures of effectiveness as opposed to simplistic measures of performance.” His comment proposed dropping the word “tactical,” so the question would read: “How should we measure effectiveness in counterinsurgency operations?” I agree with the amendment; my original phrasing was simply more specific to junior officer concerns. In Michael’s comments, there are two statements with which I’d disagree. The first is that, “cadets and junior officers are not necessarily equipped or expected to deal with these weighty issues.” I’d counter that the information-heavy (You Tube, etc.) operating environment, current organizational imperatives (i.e. U.S. Army’s Regional Alignment of Forces), and the profession itself – all demand junior leaders with a sense of strategic understanding. Ready or not, lieutenants must possess a base knowledge of military strategy. Second, on the point that “these questions would be better suited for the captains’ career course [or a master’s program].” While I agree that these questions should be consulted continually (i.e. lifelong, evolving study), the challenge with CCC is that it lacks qualified faculty. This is West Point’s institutional advantage – it has both the academic firepower and the military faculty to bring to bear on these issues. Consolidated Response: Though there are opportunities for cadets to engage with military strategy and the academic study of modern war – these are limited, scattered, ad hoc, and most importantly, not required. It is not one of the Dean’s 31 “Domains of Knowledge” which form the individual objectives across all academic programs. As baseline strategic education is not an organizational priority, it simply follows that what is available is unresourced and inconsistent. It sits in the canyon between the Dean and the Commandant; both programs graze the surface of the list of ten questions, but fall short of directly addressing them. Military tactics focuses on the practical and tactical; building platoon leaders as solid as oak trees, while what I describe is more about seeing the “forest” of modern combat. International relations and political science provide logic and theory at the broadest level – but John Mearsheimer’s offensive realism isn’t all that relevant to a platoon leader in Afghanistan. In my opinion, we incorrectly assume that all cadets have a firm grasp of this in-exhaustive list of questions based on the sum total of the parts of their education. They don’t. Which brings me to military history. I tread carefully here because I respect historians so much. I consider history both foundational and necessary (see “When Warfare Rhymes”) – yet still not sufficient for the modern junior officer. To take two examples provided in the comments: first, Gregory mentioned that my question #8 regarding logistics was at least partially addressed by employing the historical example of the “operational logistics necessary to carry out the Napoleonic campaigns.” Though important, there is clearly more to the story for a modern American junior officer. The sheer distances involved, the speed with which requests are filled – just think of the changes that have taken place in the past 20 years, let alone the last 200. Lieutenant General “Gus” Pagonis (Gulf War general in charge of logistics) wrote a book about “moving mountains” for Desert Storm. Today, just-in-time processes ensure that there are no “mountains” which pile up at any point on the supply chain. All this is not to deny history’s importance. Just that it is not enough. This is not the first time the idea has been advanced. In 1961, Sir Michael Howard famously wrote on “The Use and Abuse of Military History,” which offered “three general rules of study” for “the officer who studies military history as a guide in his profession and who wishes to avoid its pitfalls.” He advised study in “depth,” “width,” and “context.” Though history is well equipped to provide both depth and width – a crucial background – it cannot traverse the last mile to the study of today’s warfighting context. And this is what is lacking. Optimally, when cadets study both military history (depth and width) and modern war (context) as Sir Michael counseled, they can draw comparisons and separate the character of conflict from the stable continuities in war across time. “Baghdad 2003, a brilliant campaign…decapitated the capital, occupied the capital. The same kind of expert knowledge displayed in that armor offensive that was displayed in Desert Shield/Desert Storm, when we kicked Iraq out of Kuwait. The same kind – brilliant. This isn’t to suggest that West Point is failing to produce great graduates – it is, and will continue to do so. In my estimation, these cadets succeed in spite of this missing component of their education. West Point is not perfect; there is room for improvement. Not more important, but certainly as important – a course dedicated to the study of modern war merits at least some time in the curriculum. Cadets currently take four semesters of math, history, and in an engineering sequence – do we not have room to teach a basic survey course in military strategy to all of West Point’s cadets? When I tell family members and other civilians that military strategy is not required at West Point – they are shocked. Even more so if I take the time to mention that the U.S. Air Force Academy requires two such courses. **Note: All this is by way of friendly discussion – I greatly appreciate the back-and-forth. Many of the comments indicated the same. I’d also be remiss if I didn’t extend the invitation to all those that took the time to comment to write something to be published on the site. The site will only survive if it is fueled with ideas and quality writing – something these comments exemplified in spades. Major Cavanaugh, I think you (and Sir Michael Howard) are right about the importance of context in the study of history. I would argue, however, the problem is that width and depth are often ignored as well, or at least depth. Particularly depth. Of course, the title of this article is obviously correct. Military history is nowhere near enough. But the examples you use in support this argument suggest to me that (respectfully, of course) you fall into the same trap as many in the national security field regarding the use of history. No historian worth his salt would argue (at least I’d hope not) that to answer questions about logistics in modern war that we should dust off 200+ year old Napoleonic logistics manuals and use them as a "how to" in establishing and maintaining supply lines across the world to Afghanistan (or anywhere else). Likewise, no one is denying Dave Kilcullen’s point about the massive increase in means of communication today vs. even 10, 20, or 30 years ago, and the author is right that that’s important context. But I would suggest this strategic studies/IR (political science) bias* leads to an assumption (perhaps implicit) that everything is new. And this leads to a historical fallacy of comparing what the enemy has access to today with what we had access to 30 years ago, thereby giving the advantage to the enemy today. What matters is the relative advantage or disadvantage one adversary has over the other in their own time. It’s a constant process of innovation and counter-innovation, with one side innovating and the other side anticipating those changes and thereby adapting in ways that at least partially neutralize their effects, or not anticipating them and losing the advantage. And THAT is what one should take from the study of history. Certainly you would not look to the Civil War or Vietnam to understand the impact of Twitter and 24 hour news cycles, but if one is paying attention they can begin to understand patterns of innovation, how one side did or did not ask the right questions, how each side understood the impact of new technologies and did or did not anticipate their value in future conflict. An excellent example of this being done by historians is Williamson Murray and Alan Millet’s edited volume Military Innovation in the Interwar Period, which uses the interwar period to understand how states innovated or failed to innovate – and the processes by which they did either – in a time of uncertainty and budget constraints, to allow the reader to better understand and approach a similar problem in the 1990s. Dave Kilcullen has a chapter on the 2009 Mumbai attacks in Out of the Mountains to illustrate the ways LeT utilized 24/7 news and Twitter in particular to gain a real-time advantage over the Indian authorities. It was not that they had access to technologies the Indians did not, but that they better understood that historically war has been a struggle to innovate to gain an advantage while preventing the enemy from doing the same. With that understanding they found ways to use emerging technologies that the Indians simply had not anticipated. As with the Indians during the Mumbai attacks, when the Taliban or AQ puts out a video of a major attack (propaganda of the deed), the US is often caught flat-footed not because it is inhibited by technology so much as it’s inhibited by bureaucracy, standard processes, and vetting requirements to maintain a coherent message. It’s the same story as the American Patriots in 1775 (I’m in the middle of my disseration on the topic, so this is really all that’s on my mind right now) devising new ways of moving information from Boston to the other colonies much more efficiently and in a more timely manner than the British authorities could or anticipated the need for. This allowed the Patriots in other colonies to shape the information environment and gain a huge advantage over the adversary (usually royal provincial governors in other colonies) who was still trying to get any information on what was happening up in Massachusetts. Technologies change – sometimes in hugely significant ways over a very short period of time, but without the depth (and maybe even the context) in historical study the author mentions, you lose the understanding of the dynamic that exists between adversaries that requires innovation and anticipation. Instead you just compare technologies from today vs. the 1970s and dismiss the past as old and outdated and of little real use to us. As one other example, is there really much difference between the following passages? After discussing a hypothetical village elder in Afghanistan who might turn to the Taliban to settle a dispute. […] In the meantime…we can note that even if the government improves its service delivery in this particular elder’s area, reduces corruption, does a better job of law enforcement, and creates a more consistent local presence in his area…this may not help. At this point, having availed himself of the Taliban justice system, the elder’s claim to a valuable disputed asset depends on the guerrillas’ authority, and that makes it extremely difficult for him to support the government or go against the insurgents, whatever his feelings about the state. The elder in this context is a fish in the trap: he’s locked into an incentive structure that is easy and attractive to get into, but hard and painful, if not impossible, to escape." This is clever enough. Men venture in order to hold or procure popularity upon the brink, then go a Step within the Whirlpool of confusion. There, alarmed by the heat & convulsion of the Waters, they Stop Short & would endeavour to retreat & to reinstate themselves on Terra firma. No no say the deluders, here you must Stay & if you will not be active yourselves you must not now attempt to hinder our progress or by Jove we will drown you." 2b. "I was informed of the unhappy situation of the province and I am very sorry to acquaint your lordship every hour’s experience too clearly convinces me of the truth of it, and that the people of the best sense and greatest property as well as the rabble have been gradually led step by step into the most violent measures by a set of desperate and designing men." – Lord William Campbell, royal governor of South Carolina who only arrived in the colony in June 1775, to the Earl of Dartmouth, the Secretary of State for the Colonies, 2 July 1775. So I ask, is there really a lot of difference between the process by which violent non-state actors today persuade, cajole, lure, and coerce the population into a self-perpetuating system of control that increases their strength, compared to how they did so 239 years ago? I would argue that the process by which insurgent groups increase their numbers and authority – by establishing and maintaining control over populations through systems of positive and negative incentives that force them into these control systems and make it very difficult for them to turn back – might be something we can learn from history, even if the technology, structures, and other means by which they build and perpetuate this system change with the times. To further illustrate this point, if you’ve been watching the new AMC show "Turn," about the Culper spy ring during the American Revolution, which I would recommend even though it totally misunderstood the concept of "hearts and minds," one of the story lines does a good job of illustrating my point (Moderate SPOILERS follow). In late 1776-early 1777, the commander of a local British garrison in Setauket on Long Island (the base of the spy ring) is trying to root out suspected Patriots in town. They hear about a petition that had been signed by men in town supporting a town resident to be a delegate to the New York Provincial Congress in 1775. Assuming that the signatories of that rumored document would be the likely Patriot spies in town, they start looking for the document. A cowardly Patriot who had signed the document and held onto a copy for safekeeping turned it over to the British, claiming he signed it in a moment of drunken weakness. The British major ordered all the signatories be rounded up and imprisoned (their fate still to be decided in the season finale this Sunday) including the man who brought the document to them. This kind of British reaction, while to some extent perpetuating the unfair stereotype in TV and movies of the British as brutal and sadistic during the war, would not have been entirely uncommon since the British had the very legitimate argument on their side that the colonists had been toeing the line of treason by holding illegal governing assemblies for a decade, and in 1775 had crossed that line when they started seizing control of political and military power and pursuing the overthrow of the royal government in the provinces. Even if you did not expect these much more serious measures in 1775-1776 after a decade of these assemblies focusing primarily on boycotts of British goods, simply signing your name in support of the assembly could later turn out to be a death sentence as the war heated up and the movement became something you didn’t necessarily expect or support. This kind of incentive/disincentive structure certainly could have contributed to the growing strength of the Patriots even if many of their "supporters" didn’t agree with their measures, particularly the pursuit of independence from Britain. So again, this is the value of studying history (the actual history preferably, rather than the TV version). Not to learn exactly how someone did something in the past and repeat it in the present, but to understand how they thought, and how they approached a problem. Lots of things may change over time, but the human condition is generally not one of them. I am not aiming for a history/political science you-know-what measuring contest here. I’ve been in both fields and have worked with people from both fields in school and in the "real world." There are plenty of problems with the field of history, particularly academic history, and I’d be happy to talk anyone’s ear off about those problems who is interested in listening! There is little to add beyond Daniel’s thorough comments below, except that I challenge the application of Sir Michael Howard’s "context" in this discussion. I do not think that we are using it as Howard (or most historians) would use it. The "context" Howard argues for is not "today’s context" or the idea that we should take the "lessons" of past experiences and apply them directly to modern circumstances. Rather, we should examine historical events within their own contexts. We should seek to understand the whole complex ecology surrounding the historical point/event/figure/etc. under study. This prevents us from unfairly judging past actors based on present knowledge and experience, and it helps us to understand the issue in its entirety. Daniel has already elaborated on the utility of studying an issue in its entirety so I will not go further, but I want to correct any misperceptions about Howard’s (and history’s) context.